Amar Manzoor is the Director of 7Tao Engineering Ltd. After pursuing an international and multicultural engineering education in Asia, North America and Europe, he gained several advanced degrees in Computer Science and Engineering as well as exposure to the companies of Lucas Aerospace, AlliedSignal Aeropspace and Honeywell Aerospace where he cut his teeth in advanced manufacturing systems. During a 6-year stint teaching 80 advanced manufacturing firms world class manufacturing techniques, he embarked on a mission to design a business system based on the principles of Chinese business industrial warfare. He had a natural interest in what engineering would look like in fighting form because of his lifetime exposure to Asian fighting disciplines. He called the system ‘7Tao, The Art of Industrial War’. Amar’s system has recently been licensed for use in the USA under the name SPECTRE . “One of the greatest threats to businesses in the Western world is a culture that makes them unable to compete with countries that don’t play by the same rules. A new system has already changed the culture of businesses in the United Kingdom, and has recently been released in the United States… Fleming (CEO, BLACKOPS Partners Corporation) said in their experience, 7Tao has been able to increase productivity, empower employees, build teams, and provides 360 degree awareness.” From a review in The Epoch Times. Read full article here. At the end of 2014 China overtook America as the world’s largest economy. Here is how they did it! The Art of Industrial Warfare is an introduction to a new business management methodology designed to combat the increasing menace of China’s growing industrial, economic and military might. The West, having won the 20th century ideological battle between Soviet communism and Western capitalism, was slow to realise that the battle with China was no longer ideological but a straight fight between Chinese and Western capitalism. A British company, 7Tao, was quick to realize that the 21st century would be dominated by this struggle between an emergent China and a declining USA, and, more generally, by a decline in the industrial dominance of the West and a rise in the importance of East Asia. 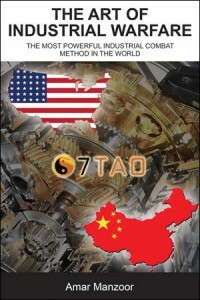 Appreciating that the existing Western business models were inadequate for countering the growing dominance of Chinese business, in 1999 the author developed and began teaching the art of industrial warfare through a powerful Chinese business methodology he named 7Tao. To the Chinese, competing in the global economy is a combat discipline, so what better way of dealing with the situation than using their tactics? This book reveals some of the most inspiring secrets of the Chinese business practice of industrial warfare so that the West can compete again on a level playing field. It shows how factories, markets, and whole economic regions can benefit from adopting the mindset of industrial and economic warfare. 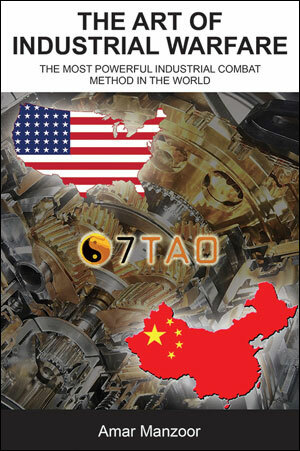 7Tao has been conducting industrial combat seminars across a large number of companies for over ten years, implementing the industrial fighting system and actually preparing companies for what will be a difficult future. The results were not just enlightening, they were astonishing. Amar talks about 7Tao method and his book in this video.